The clock is ticking, but has time run out – not just for the characters, but for the event comic itself? 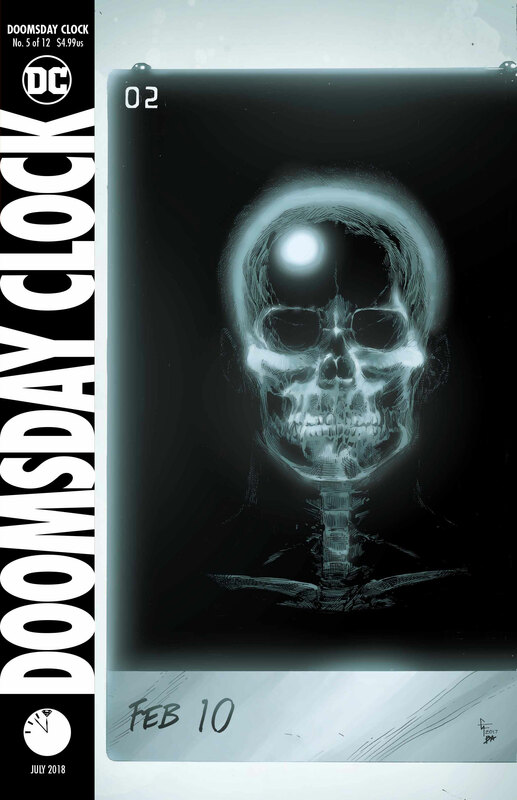 Originally scheduled for 23rd May, there’s an argument to he bad that Doomsday Clock is getting lost between Dark Knights/No Justice, its bi-monthly release and general event fatigue. This is perhaps a little unfair, but at the same time points to wider issues: after the torrent of net-rage about such an iconic crossover (buttons and big blue hands notwithstanding), it seems that the giant New 52/Rebirth MacGuffin simply lacks relevance to readers 2 years on. And yet, Mime and Marionette are two of the most impressive new additions to DC’s criminal underclass, and there’s a genuinely compelling – and surprisingly understated – story here from one of DC’s modern greats. In a rather contrary fashion, I’ve got to talk about Gary Frank’s art first. His pencils are off the chart, savaging at the panels one moment, gliding across them the next. They’re raw and rough and beautiful, conveying the grit and edge that’s absolutely necessary to sell the world of Watchmen – and place familiar sights of the DCU in it, from a strident Lois Lane in blindingly bright Metropolis to a Comedian carving his way through an Arkham Asylum that looks gouged out of charcoal. Writing about the plot itself is more challenging. It’s good – really good, actually, and feels thematically part of the Rebirth era, with for example the botched intervention in Russia by Hawk and Dove echoing Priest’s recent Justice League storyline. It’s great to see the bloody swathe that Mime and Marionette carve, or the brutal, blunt dialogue between Wayne and Veidt. There’s great mysteries here, too, reaching back to the depths of DC history, with the rumoured return of Alan Scott starting to unfold over the course of the issue, and the very bloody return of Black Adam (outside of the pages of Metal). Plus, I love the focus on the non-American super teams, particularly the Russian People’s heroes, but seeing the likes of Geo-Force or Knight and Squire back in play makes my little geeky heart sing. But I can’t help feel that it’s the usual problem of crossovers – the question of where it fits into wider continuity – multiplied, because it’s supposed to be so integral to the Rebirth era. It jars, in a way that even Dark Nights Metal managed (just about) to avoid. Which is not to say don’t read it – far from it – but may go some way to explain why it’s almost slipped apologetically under the radar and off pull lists. But that would be a mistake. It’s a great story, a surprisingly restrained yet effective entry point back into the colliding worlds, and genuinely a fitting successor to Moore’s epic. And I’ve not even talked about the Comedian stealing the issue in one classic, 9-panel page. Do yourself a favour. Leave your preconceptions at the door, and watch worlds collide.